Not even the United States meets Trump's new goal of annual spending of 4 percent of each nation's gross domestic product. 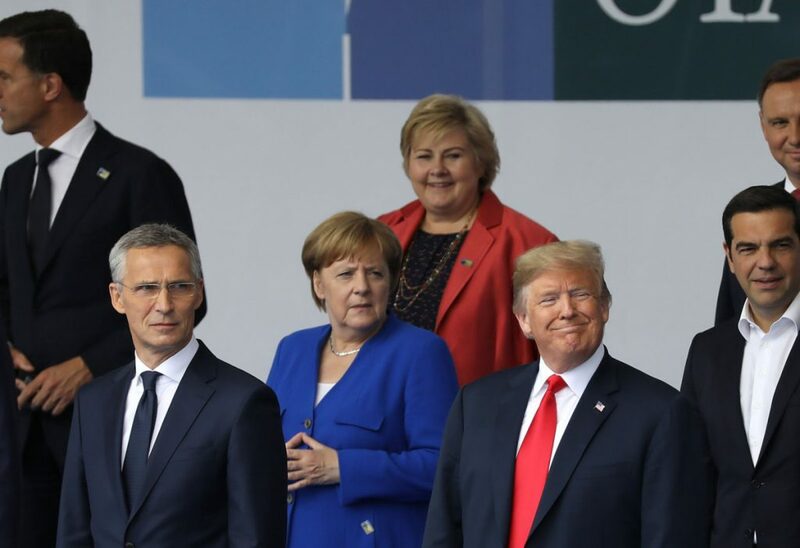 On spending, Trump insisted in a closed-door meeting of NATO leaders that the alliance increase its defense targets to 4 percent of each country’s gross domestic product – more than what the United States channels toward its military. It was not clear whether he was serious about a new standard or whether he was using the number as a negotiating tactic to edge overall spending higher and get European nations to pay more. President Trump, German Chancellor Angela Merkel, center, and NATO Secretary General Jens Stoltenberg, left, stand for a photo during the NATO summit in Brussels on Wednesday. Trump went to Europe saying that next week’s summit with Putin may be the easiest part of his week of diplomacy – an unusual assertion, challenging the notion that NATO should project a strong and united front against a strategic rival. Even Stoltenberg – a mild-mannered former Norwegian prime minister who has cultivated a positive relationship with the president – appeared reduced to spluttering as Trump cut him off after he started to explain that allies traded with Russia even during the Cold War. Earlier in the exchange, Trump demanded credit from Stoltenberg for forcing an increase of NATO defense budgets. Trump’s criticism set off immediate anxiety in Germany. Munich’s Süddeutsche Zeitung headlined its story: “It is not only bad, it is catastrophic.” Russia’s state-owned Rossiya 1 broadcaster – a reliable proxy for Kremlin views – blasted the remarks as well.